BOSTON, MA – Boston Bruins General Manager Peter Chiarelli announced today, March 20, that the club has signed forward Ben Sexton to an entry-level contract. Sexton will join the Providence Bruins (American Hockey League). Sexton played 35 games this season for the Clarkson University Golden Knights, where he notched six goals and 22 assists with a plus-five rating. Sexton ranks first on Clarkson’s roster in assists and second on the team in points with 28. The senior captain led Clarkson to the ECAC Tournament Quarterfinals this season where he recorded five assists in six games. Sexton has played at Clarkson University for four seasons (2010-14), appearing in a total of 102 games. Throughout his collegiate career, the 22-year-old has scored 24 goals and has accrued 61 helpers, totaling 85 points. As a junior in 2012-13, Sexton was named captain and tied for second on the team for points with 20. 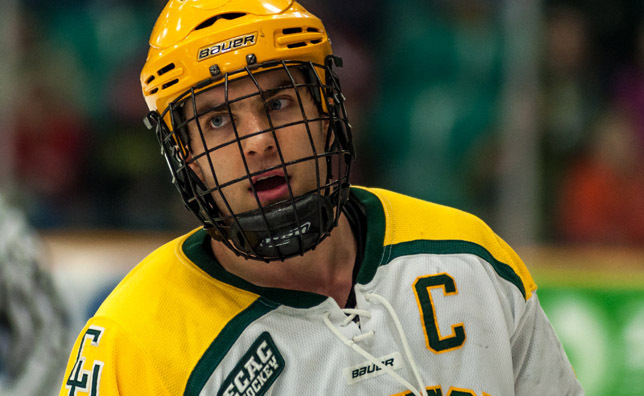 The Kanata, Ontario native was honored with Clarkson’s Mike Morrison Dedication award, the Clarkson Ironman award, and was named to the ECAC All-Academic team. Before becoming a Golden Knight, Sexton played a season with the Penticton Vees (2009-10) of the British Columbia Hockey League where he recorded 13 goals and 29 assists for 42 points. He also competed for the Nepean Raiders of the Canadian Junior Hockey League for two seasons (2007-09) where he totaled 29 goals and 36 assists for 65 points. The 6'0", 203-pound forward was drafted by the Boston Bruins in the seventh round (206th overall) of the 2009 NHL Entry Draft.